G. Harry Stine, founder of the hobby of model rocketry and of the NAR, used to tell adults who wanted to thank him and offer to pay him back for the work he had done to inspire them with rocketry as young people “don’t pay back, pay forward to the next generation”. Wide support among our members for “paying forward” has been a hallmark of the NAR since its beginning. If those of us who are adult leaders in the NAR and its Sections do not make outreach a priority and spend at least some of our rocketry time on it, reaching out both to young people and to school and community leaders, the hobby and the NAR will fade away over time. Outreach programs are a way in which NAR Sections can pay forward and spread enthusiasm for our hobby and for aerospace sciences in general. These programs involve having experienced rocketeers conduct a structured activity that passes along rocketry information and skills as well as enthusiasm, to those not familiar with the hobby or with the techniques of building and flying rockets. 1. Demonstration launches for large groups or for the general public, with a public address message about the hobby and with information brochures available (covered in the “Publicity“ section of the Guidebook). 2. Classes for groups about how rockets work and about elements of the hobby. 3. Group rocket-building sessions, potentially with a launching session either immediately afterward or within a few days. 4. 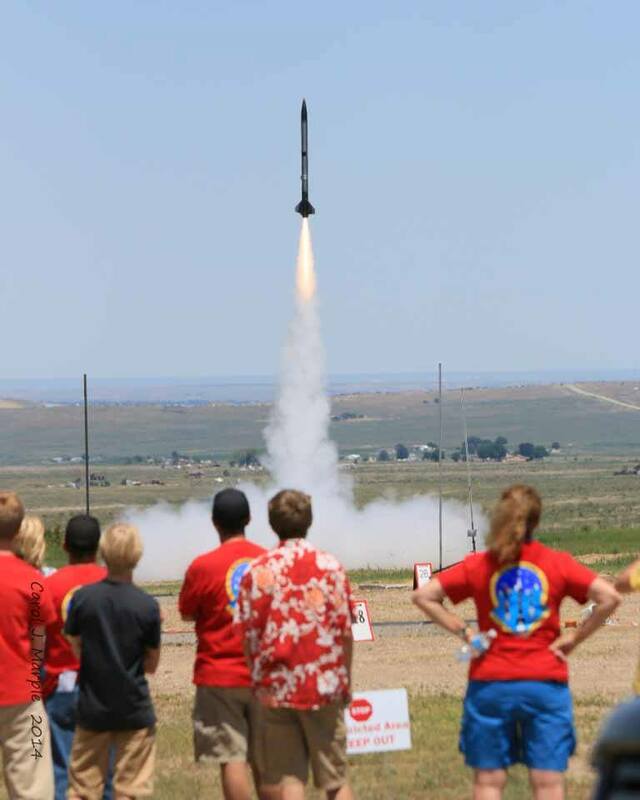 Support for participants in structured national rocketry programs such as the NAR/AIA Team America Rocketry Challenge or the NASA Student Launch Initiative. In general, outreach ought to be targeted to people whom it is likely will have some interest in and ability to participate in rocketry activities (either academic or hobby-related) following that day’s interaction. It should have a message that is being communicated (“join our Section and have this kind of fun with us” or “study math and science so you can be a rocket scientist”) or an objective that is being pursued (earning a Merit Badge, completing a class learning objective) and must have content targeted to this message and to the age group and interests of the audience in order to be effective. Typically events that include a hands on activity such as building and/or flying a rocket are more effective in stimulating follow-on interest than more passive classroom type activities. Of course, presentations to groups can reach a much bigger audience, so if these are your opportunity, livening them up with videos of rocket launches or using pass-around examples of rockets may help enhance audience interest. Don’t expect huge return from any single outreach activity; persistence is the key to long-term success and “Bunny’s rule of tens” (named by and for a former NAR President) generally applies: for every ten interested people who are in a participating group you will normally at best get one who takes the next step (coming to a launch after a building session, for example); and then for every ten who take this second step, one may take the final step by becoming an actual member of the Section or active hobbyist. Combining steps with your participants, such as having a launch after a building session at the same site on the same day, may improve your return ratio. If you have young people fly their first-ever rocket with you as part of one of your outreach programs, you can present them with a NAR Rocket Flight Certificate (see the file below in Related Documents). We started this certificate as a “Fly 50K” program where we were working toward getting 50,000 young people to do their first rocket flight with a NAR Section as part of celebrating our 50th anniversary as an organization in 2008. We still have not reached that goal officially, so if you hold a launch where you award these certificates, be sure to report your number of first flights to the NAR using this online Fly 50K Reporting Form. Another NAR program that is well-suited to working with young rocketeers and recognizing them for the achievement of their first couple of flights within a more structured process with specific, but easy-to-attain objectives is the NARTREK Cadet Program. Science teachers are often open to ideas about how to build enthusiasm in their students for science-related activities. Some of them may already use model rocketry in their school classrooms, or as a club after school. Seek out these teachers and invite them to join your Section. If they are into rocketry, offer to help. If they are not, offer to teach them how – use the educator resources on the NAR website as a starting point. Time is a limiting factor for teachers; they have many learning objectives to cover in their classroom time, and many school-related tasks they have to perform in their time outside of the classroom. So their capacity to spend their own time on rocketry may be limited, and your help may be welcome. Liability and risk from rocketry may be an issue for school administrators; use the resources about safety on the NAR website to make the case with them about the hobby’s safety. Summer camps or youth after-school “camp”-like activity groups with a science-education theme may include or be willing to include rocketry in their programs. These types of groups typically have much more time available than schools for their participants to devote to a single activity such as rocketry. They can also become long-term commitments for repeated programs, which can be either good (lots of young people get the rocketry experience) or bad (the volunteers who do this may burn out or not be able to keep up with the time demand). Boy Scouts of America is a natural for model rocketry as one of their Merit Badges is in Space Exploration. One of the requirements of this merit badge is to build and successfully launch a model rocket, and then launch it a second time with some kind of mission in mind. This mission does not have to be a complicated one. It can be to simply land a rocket within a specific distance of a flag in the launch area. There are also many knowledge requirements connected with this merit badge (see the web link above), but the rocketry part of it gives the local Section a perfect opportunity for outreach. Members of the Section could start by having a demonstration launch, and follow with a building session and launch with the scouts who choose to participate. 4 or 5 evening sessions with the scouts or one full weekend day should be enough to complete all the Merit Badge requirements. The NAR has a national partnership agreement with 4-H. 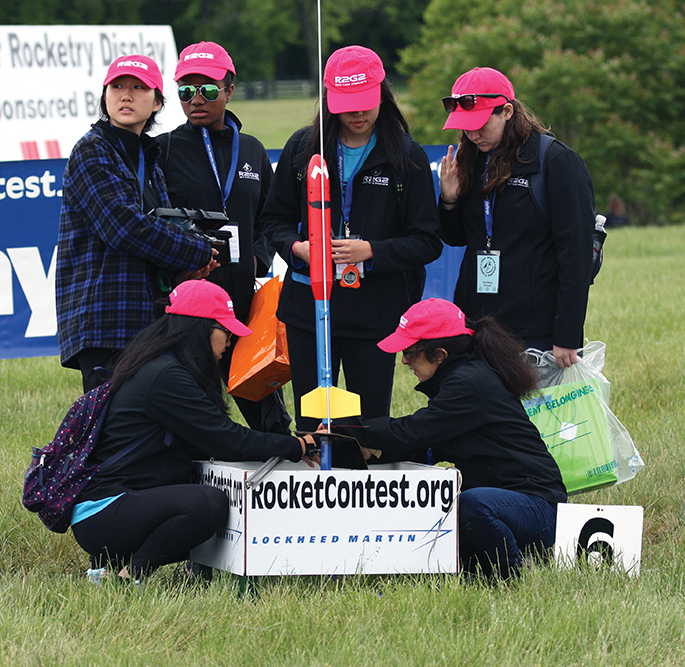 They have a mission to engage young people in science, engineering, and technology (SET) activities through their local 4-H chapters, and we are their official source of information and volunteers to help local 4-H groups that want to do this using rocketry. 4-H is in every county in the US, has more young people as participants than Girl and Boy Scouts combined, and has adult supervisors in many of its chapters who own farm land and pastures! They do not have a national program like a merit badge for rocketry, but lots of local 4-H chapters have science as their principal activity, and quite a number have rocketry specifically as their core activity. The Civil Air Patrol is an aerospace education and military skill development program run by the US Air Force for young people. There is a structured (but optional) rocketry program within CAP that a number of “squadrons” (units or clubs) choose to follow, and that was drawn significantly from NAR programs. CAP encourages its cadets to become NAR members and its squadrons to become NAR Sections. Like any youth group, CAP units often value the advice and contribution of volunteer experts to run particular educational units or to provide support such as operating a launch range for a unit rocketry session. The Air Force also runs Junior ROTC units at over 800 high schools around the country and some of these units have model rocket programs (not exactly the same as CAP). Check with your local high school to see if they have a unit that might be interested in a rocketry program. Sections have run rocketry displays and demonstration launches in local community or county fairs and community day celebrations, and at air shows. They have partnered with local hobby stores to do “make it, fly it, and take it” sessions where the store offers the kits at a discount and provides a building spot and potentially a launching site nearby. They have set up and run displays about rocketry and the NAR in science or aviation museums, teacher conventions, or conventions of other groups likely to have an interest in rocketry. They have worked with Challenger Learning Centers or local science or aviation museums that run programs including model rocketry. Every community has its own unique opportunities for an audience you can reach out to; just make sure that the audience is one that is likely to include the kind of people who will actually follow up and engage in rocketry and potentially join your Section.